Queensland’s water polo community is celebrating wins at the inaugural Australian Pride in Sport Awards in Melbourne on Tuesday night. The awards recognise exceptional efforts in making Australian sport more inclusive of LGBTIQ people. Jeremy Archer (pictured, third from left), the Brisbane Tritons’ first president and now Water Polo Queensland Diversity officer, took home the award for Out Role Model. The National Water Polo League’s Pride Cup and Pride Shield won the LGBTI Inclusion Initiative Award. The Pride Cup was first held in Melbourne two years ago to promote inclusion in water polo, and has since been hosted in Brisbane twice. The Gold Coast 2018 Commonwealth Games Corporation (GOLDOC) also received the Achievement Award for Most Improved. GOLDOC was praised in April for staging an LGBTIQ-specific concert at Surfers Paradise as part of the Games’ arts and cultural festival. The St. Kilda Football Club took home the award for the Highest Ranking Overall sporting organisation, while Cricket Victoria were recognised as the Highest Ranking State Sporting Organisation. The NRL took out the Highest Ranking National Sporting Organisation award, and Emma Staples from Cricket Australia won the LGBTI Ally Award. 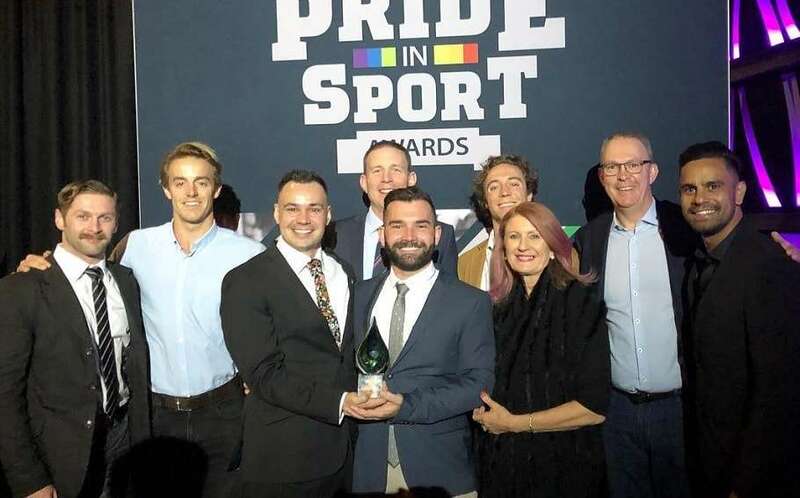 The Perth Pythons Hockey Club won for LGBTI Community Sport, and Pythons coach Reid Smith won the LGBTI Inclusive Coach award. The Pride in Sport Index was launched in 2016 to establish a framework for sporting organisations to evaluate their LGBTIQ initiatives and policies. ACON Vice-President and PSI co-founder Andrew Purchas congratulated all of the winners, at the inaugural awards as well as the many others working towards making Australian sport an inclusive place for everyone. “In 2014, Australia’s major sporting codes signed up to the Australian Anti Homophobia and Inclusion Framework for Australian Sport,” he said. “These awards and the index continue this important work as they provide sporting organisations with an opportunity to reflect on their work in the inclusion of LGBTI participants and staff, and identify areas they can address to ensure their sport is truly inclusive.